Detail from ‘The Farmer’s Court’, by Pieter Cornelis Troost. Rijksmuseum, Amsterdam (CC0 1.0 Universal). It’s been another busy year for the Project. With our first two work packages on port books (including 11,588 consignments and 16,468 commodity instances) and church court depositions (including 1,783 transcribed statements, 4,091 actors, and 953 comprehensively modelled intoxication events) safely dispatched, since spring 2015 we’ve been packing our database with various records relating to our third research strand on the government of intoxicants and intoxication. Whereas our first two themes focussed on a single type of source, interrogating governance has involved work on diverse manuscript genres from our case study sites (Norfolk, and Cheshire and south Lancashire). This post briefly introduces them. A first step was to supplement our rich haul of ecclesiastical court depositions with examinations taken before the civil court of Quarter Sessions. The structure of the documents – essentially witness statements – is near-identical, but whereas the church courts were concerned primarily with moral, spiritual, and reputational offences, Quarter Sessions dealt with secular crimes (thefts, burglaries, physical and sexual assaults, murders, and sedition). 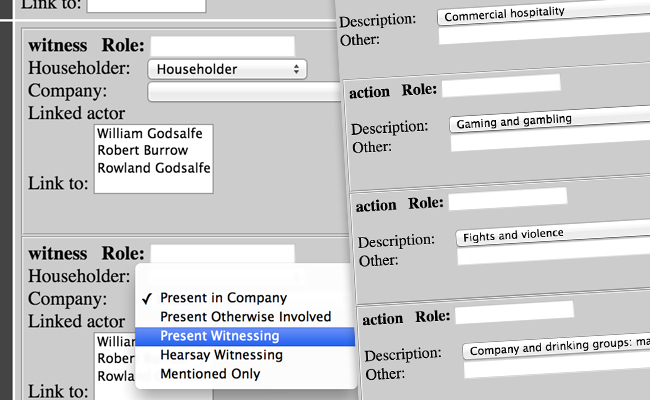 As with church court depositions, they can be used to recover a wealth of incidental detail about intoxicants (see the example below) – itself often non-transgressive – which we’ve again transcribed and event modelled within our data entry environment. A systematic trawl through the jurisdictions of Norwich, Norfolk, Chester, and Lancashire turned up 982 witness statements featuring 1,902 actors and comprising 713 intoxication events. 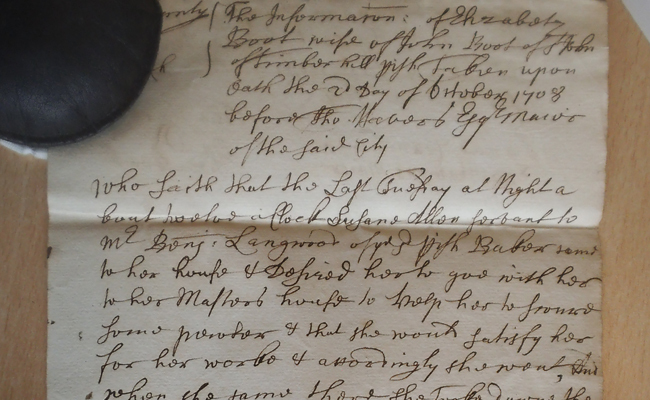 Clean-Up Operation: In a Quarter Sessions information taken before the Mayor of Norwich on 2 October 1708, Elizabeth Boot describes being summoned at midnight by a servant of baker (and alehouse-keeper) Benjamin Langwood to ‘help her scour some pewter’. Norfolk Record Office, NCR Case 12b, Box 1, Bundle 4. Model Behaviour: Our online data creation environment allows us to model intoxication events described in Quarter Sessions examinations by capturing structured information on times of day, settings, components, participants, and so on. A next step was to supplement this discursive material with an investigation of alehouse licences for Norwich, Chester, and the semi-rural case study sites of Thetford (Norfolk) and Manchester parish (Lancashire), the latter pair chosen for their profusion of surviving records. 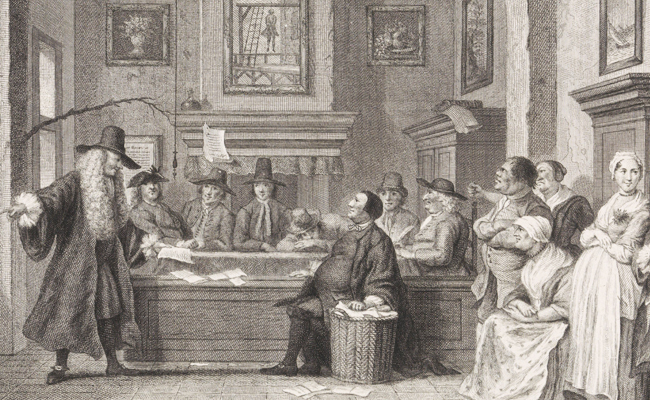 Alehouse licensing, introduced by statute 1552 and also delegated to city and county Quarter Sessions, was the main instrument by which the most ubiquitous drinking place in early modern England was regulated, and represents one of the most ambitious programmes of early modern civil status registration outside of the parish registers. However, the licences themselves have evaded systematic scholarly analysis. Working with alehouse recognizances – records of the formal agreements entered into by licensees and their sureties, an example of which can be seen below – we’ve recorded detailed information on 9,472 licensed retailers and an additional c.17,500 friends, neighbours, and colleagues who provided bonds for their good behaviour (a particularly valuable aspect of these records from which broader social networks can be reconstructed). 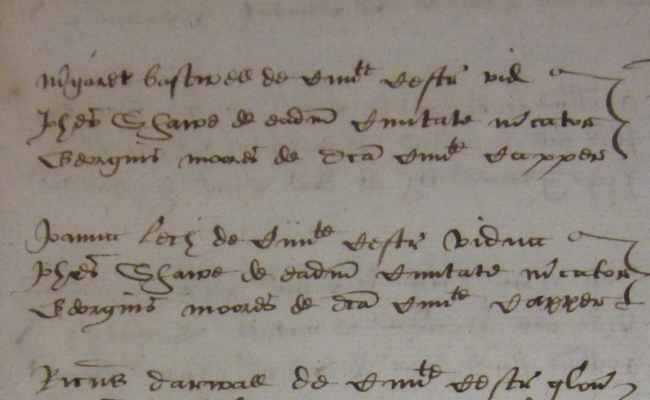 Merry Wives: The 1575 alehouse recognizances of Chester widows Margaret Bastwell (top) and Joanna Lech (bottom). Sureties in both cases were provided by merchant John Shaw and capper George Moores. Cheshire Archives and Local Studies, ZQRL/2. Our next task was to reconstruct a different aspect of the regulatory landscape by exploring local orders relating to intoxicants, together with presentments and prosecutions of those deemed guilty of intoxicant-related offences (from retailing tobacco without licence, to public drunkenness, to encroaching on the highway with signboards). A sample of ordinances and charges generated by governing institutions within the case study sites – Chester and Norwich assemblies (governing bodies), Chester Quarter Sessions, Norwich Mayor’s Court, Norfolk and Lancashire Quarter Sessions, and Manchester’s active Court Leet – has yielded 432 orders and 403 presentments relating to intoxicants involving a total of 4,106 individuals. 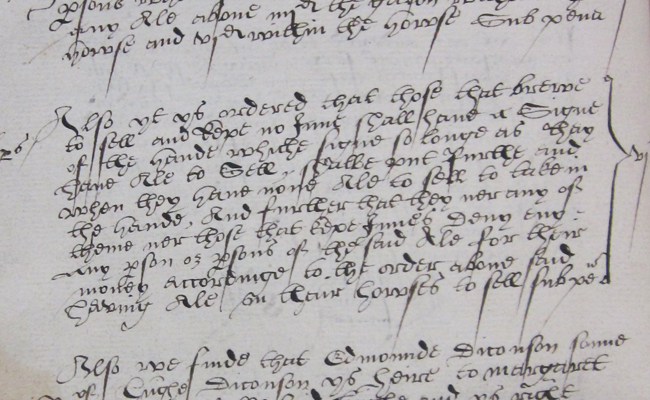 Walk to the Hand: A 1561 directive from Manchester’s Court Leet ordering all city alehouses to display ‘a sign of the hand’. Greater Manchester County Record Office, M6 21/1/1, fol. 33v. An exclusive focus on licensing, orders, and presentments can lead to a picture of intoxicant regulation that is one-sided and top-down. Accordingly, and finally, we’ve supplemented our work on these officially generated records with an exploration of Quarter Sessions petitions from Norwich, Chester, and especially Lancashire (where they survive in vast numbers at Lancashire Record Office). 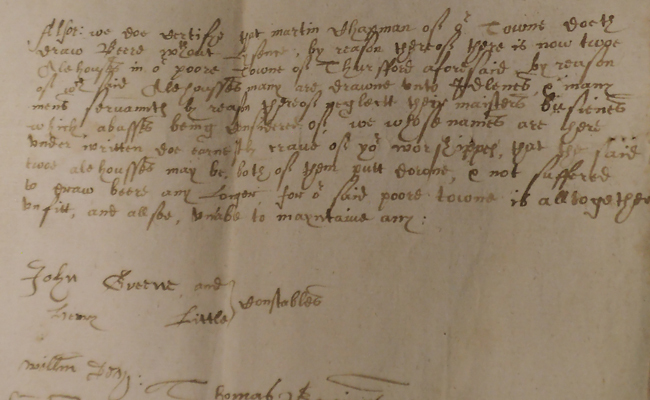 Fascinating documents that are generating increasing scholarly interest (see this post, this post, and this workshop), petitions were a key means by which early modern people negotiated with authority, and we’ve identified, transcribed, and categorised 212 relating to intoxicants (mainly, but not exclusively, sent on behalf of or against particular alehouses and their keepers). The fact that we’ve also captured information on 768 signatories means that – as with licensees’ sureties – we can begin to reconstruct the intersection of intoxicants and power relations within local communities. Unfit for Purpose: Some inhabitants of the Norfolk village of Thursford, spearheaded by the constables, complain about the unlicensed alehouse of Martin Chapman in 1620 and urge local magistrates to suppress it. Norfolk Record Office, C/S 3/Box 22. So, a busy year for us, but there’s still no let-up in the pace as we focus on our next work package – probate inventories – relating to our fourth research strand on material culture (we’ve so far entered 376 inventories, 31,387 object instances, and counting). A post on this will follow shortly. Brown, J., ‘The Landscape of Drink: Inns, Taverns, and Alehouses in Early Modern Southampton’ (PhD Thesis, University of Warwick, 2008), pp. 210–70. Brown, J., ‘Alehouse Licensing and State Formation in Early Modern England’, in J. Herring, C. Regan, D. Weinberg, P. Withington (eds), Intoxication and Society: Problematic Pleasures of Drugs and Alcohol (Basingstoke, 2012), pp. 110–32. Hailwood, M., Alehouses and Good Fellowship in Early Modern England (Woodbridge, 2014), pp. 59–112. Hunter, J., ‘English Inns, Taverns, Alehouses and Brandy Shops: The Legislative Framework’, in B. Kümin & B. A. Tlusty (eds), The World of the Tavern: Public Houses in Early Modern Europe (Aldershot, 2002), pp. 65–82. King, W. J., ‘Regulation of Alehouses in Stuart Lancashire: An Example of Discretionary Administration of the Law’, Transactions of the Historic Society of Lancashire and Cheshire 129 (1980): 31–46. Wrightson, K., ‘Alehouses, Order, and Reformation in Rural England, 1590-1660’, in E. Yeo & S. Yeo (eds), Popular Culture and Class Conflict, 1590-1914 (Brighton, 1981), pp. 1–27.